This is okay to use and okay to apply. The first coat is slightly streaky but the others after that are fine. Drying time seemed okay (4 minutes a coat). 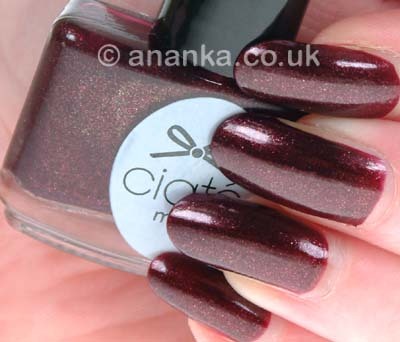 At first I thought it was a browny polish, but once on the nail it looked more red-like with a lovely shimmer. Lasted well. Looks very pretty, vampy and elegant. Ananka, you grew longer nails, they look great! LOVE colors like this and it pleases me when they're more red than brown, too. 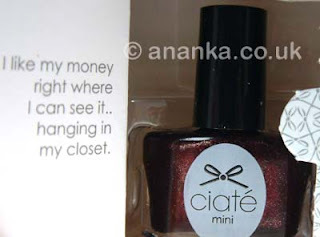 Also it sounds to me like Ciate needs to work on their formulas a bit? Haha that's an understatement - they really do! 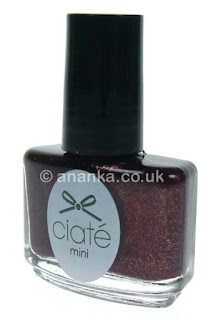 I do like the shimmer in this one - actually also the color - rather vampy! It has a lovely shimmer! Oh I love this! Dark, intense, gorgeous!